Be swept away by a garden in full bloom with the Night Garden cathedral veil. A showstopper veil that creates a compelling mood of romanticism and femininity. The Night Garden veil is a bold and exquisite piece, featuring a harmonious balance of intricate details in a clean silhouette. Hand-beaded botanical and lace appliques float down this cathedral length veil, starting at the fingertips and extending onto a long sweeping train. Equal parts elegant and breathtaking. Hand embellished with fine imported lace, handcrafted flowers with beaded centres, Swarovski pearls. Colours: Soft ivory only. Colour samples in attached photos. Also, see styling tab below. Customisable: Shorter or longer lengths available, including variations to the placement of the embellishments. The Night Garden veil is made to order. Please allow 8 weeks for production plus delivery times. A cathedral length veil is all about regal appeal. When combined with handcrafted couture details, the look is the ultimate in bridal styling. The Night Garden veil falls to 300cm from the comb to the end of the train. This veil doesn’t feature a blusher layer to pull over your face. Instead, it’s designed to frame the hairline or it can be styled above a bridal bun. 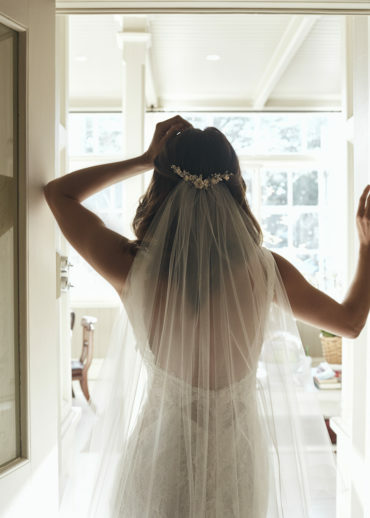 The lace details on this veil start at the fingertip and extend down to the train. The top and middle section of this veil is left bare so it can blend in beautifully with your wedding dress without overwhelming it. A blusher layer can be added. This may include lace details across the blusher or a plain blusher. Please contact us and we can chat about how to best customise this design to suit your wedding dress. The lace can be extended across the full circumference of the veil (i.e from the comb down to the train). A longer or shorter length to suit the length of your wedding dress and height. If you are unsure which length will best suit your wedding dress, please contact us with photos of your wedding dress and height and we can get back to you with a recommendation. The Night Garden veil is handcrafted from a lightweight bridal illusion tulle in soft ivory tones only. We like to aim for a colour match or a shade lighter than your wedding dress.